At long last – my peak ultra training week! I ran nearly 60 miles this week, which is a lot of miles for anyone, but when you are a slower runner like me, it all but takes over your life. Rest feels even better when it’s well-earned. Just my usual 4 mile loop this morning. I’m still noticeably tired from my weekend adventures. I had ZERO interest in going for this run today. I got up early, wanting to get it done so my longer run wouldn’t take up my entire day, but then I stalled and procrastinated almost an hour before I actually left the house. 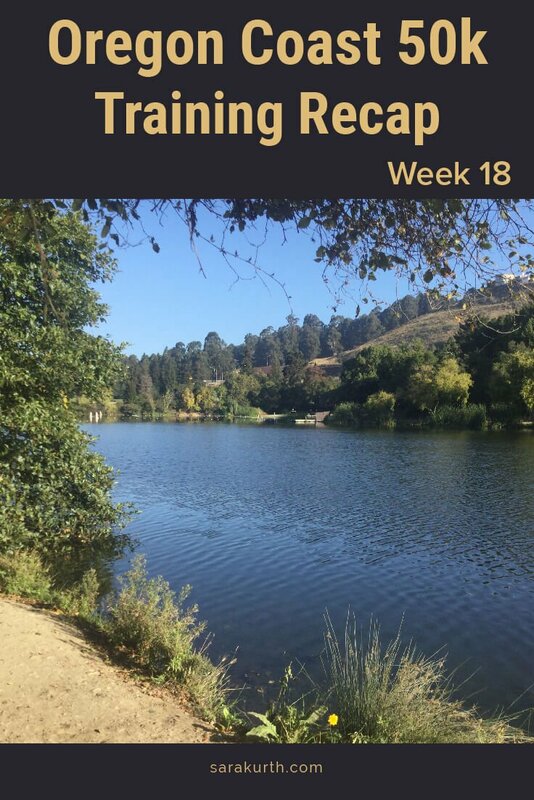 Like last week, I ran from home over to Lake Temescal, looped the lake a few times, switching up the routes, mixing and matching the two rim trails, and home. Best part of the run? I had a river otter sighting in the lake. I didn’t know there were river otters in the East Bay, but apparently, they are making a huge comeback. They were fun to watch and a good excuse for a stretch break. It wasn’t bad, I just felt worn down and had a general lack of energy. Walked on the uphill (the first mile) way more than I usually do. Morning stretching, and nothing else of note. I’m feeling the cumulative impact of all my mileage and I’m resting as much as possible. Today is my least favorite day of the ultra training cycle. I get up on a random Saturday and run a marathon. Sure, I did a marathon a few weeks ago as a training run at Santa Rosa, but that was an actual marathon – aid stations, spectators, finishers medals. Today was just like every other training run, it was just a marathon. Or more specifically, it was 26 miles, but of course I added in the extra .2. What kind of monster wouldn’t finish it off? I didn’t consider until later that I should have run 26.3 – made it an ultramarathon. Oh well. I went out to the Iron Horse trail for this run, so it was a straight and flat out-and-back. I figured 26 miles was going to be hard enough, I really wasn’t feeling doing 26 + lots of elevation. Plus Iron Horse has bathrooms and water fountains, so I wasn’t totally on my own support wise. On the run itself, I actually felt not too bad. As has been true with many of my training runs, I felt consistently good throughout the run. While I never felt ‘spectacular,’ I felt pretty good at mile 2, and I felt just as pretty good at mile 25. If I had to pick one or the other I’d much rather feel consistently pretty good, and that is exactly what happened. I feel like I ran this at a good ‘easy run’ pace and still finished in 4:45. That really makes me wonder what my current road marathon pace would be. It’s been years since I’ve done a marathon that I didn’t pace or that wasn’t on a crazy trail. I was wrong yesterday when I said that the solo marathon is my least favorite day of ultra training. I think today is, in fact, the worst day. The day after I ran a solo marathon, still tired and sore (and likely a touch dehydrated), I have to get up and run another 10 miles. Ugh. Today followed the pattern of so many days of the last few weeks: I got up later than I knew I should (because getting up would mean I’d have to run), I stalled more than I should have (because not stalling would mean I’d have to run), but eventually, I just got started already. Once I got running, I felt fine. A bit of lack of oomph (hmmm… I wonder why), but overall, it went surprisingly well. I (again) bailed on strength work, nearly 60 miles of running took up enough of my time and energy. I more than made up for it in time spent foam rolling. I totally realize this is a lame excuse. I’m fully in the ‘I’m over it’ stage of training. For me, the tell-tale sign is what has been happening to me all week – I’m totally fine on the run (once I get started), but getting started is way harder than it has to be. This always happens occasionally throughout training, but when it happens on every run, it’s the sure sign I’m mentally wearing out. But now it’s taper time! Mindset. I can’t keep mentally fighting every single run.